Blooming Where Planted: Happy 5ths! The Julius twins turned 5 on the 7th, but we hadn't been able to see them. By the time we saw them last Saturday at swim class they were beside themselves with joy. This year they have really been sprouting entirely different personalities, and to prove such, the twins birthday party appealed to both of them. For Sarah, there were all kinds of superhero references. Her theme was Batman. And for Kristin, there was Frozen. But I had never been to a Frozen/Batman/swim party. But as you can imagine, my boys would be All over that. And it was perfect for the girls too. Kristin was right there to welcome us when we entered. It's a little spooky that she's just about as tall as Christopher, though there is 3 years between them. Though since he's got his head just so, it looks like she's taller. They are going to battle it out for a while. These girls grow fast! Sarah loves me. She comes up to me lots and lots and tells me so. It always makes my day. Although she's getting so big that she doesn't call me Kapfleen anymore. I've upgraded to Caffee. I think I may have even heard Cathy once. I shall be sad when she just calls me Cathy, but she had better never stop her random hugging and telling me she loves me. Because I have gotten quite accustomed to her loving, and don't want to give it up. Shortly after our arrival, the boys got to suit up and go out back for the swim party portion of the Birthday Party! Sam, Sarah, and Rachel (the littles) took to the pool. They kept the splashing to a minimum and were having a fine time. And Chris, Em, Kristin, and Mary, (the bigs) wanted to start water balloon fights. The water balloon fights then took to the pool. Not too sure about all that. But the kids seemed to have a lot of fun. The wee ones, Jake and John, stayed back, observed the insanity, and decided it most wise to stay by their daddies. Good call boys. These kids be crazy. Eventually the water ballooning stopped, and the kids created their own whirlpool. Happy Birthday Kristin and Sarah! Then it was time to blow out the candles. Kristin got hers going ok, and she made her wish. But the wind started to pick up, and Sarah wanted some help blowing hers out. She got pretty upset when it seemed the wind wanted to do the job. We brought her in and she got to eat her special batman cupcake indoors. Jacob has this exact same shirt - fancy that! It was a very Batman birthday for Sarah. And a very Frozen birthday for Kristin. We got the girls some scooters, that transfer from 3 wheelers to 2 wheelers, in their favorite colors. 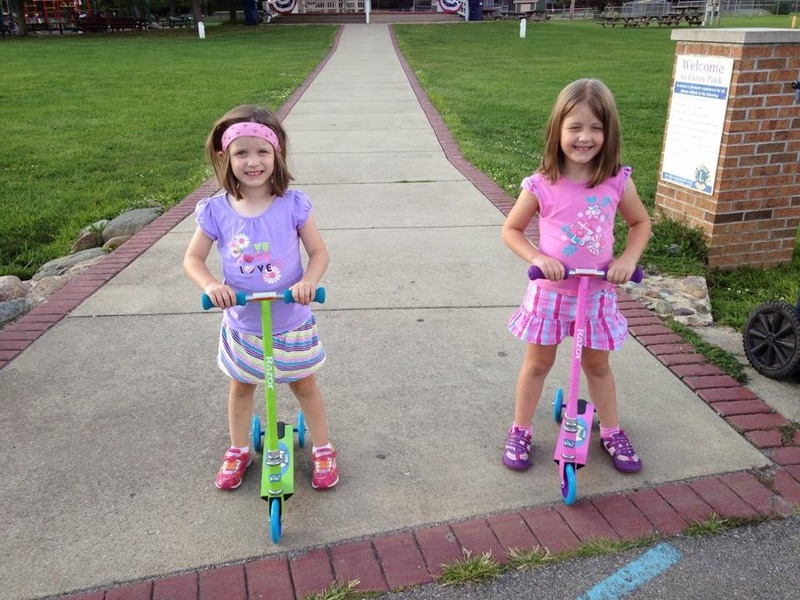 The scooters were a smash hit - and it's pretty wonderful that they are 5!